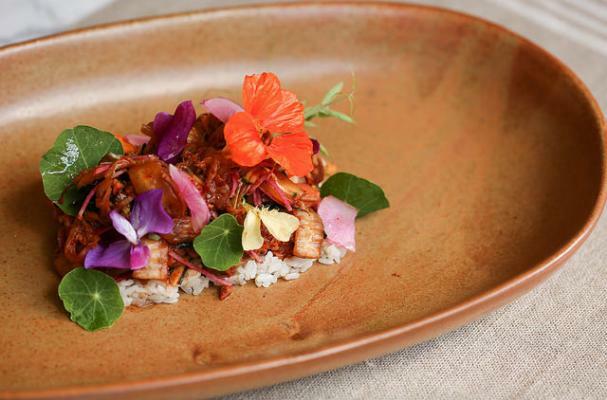 Kimchi, a spicy Korean vegetable dish, is known for its depth of flavor as well as its nutrients and probiotic benefits. 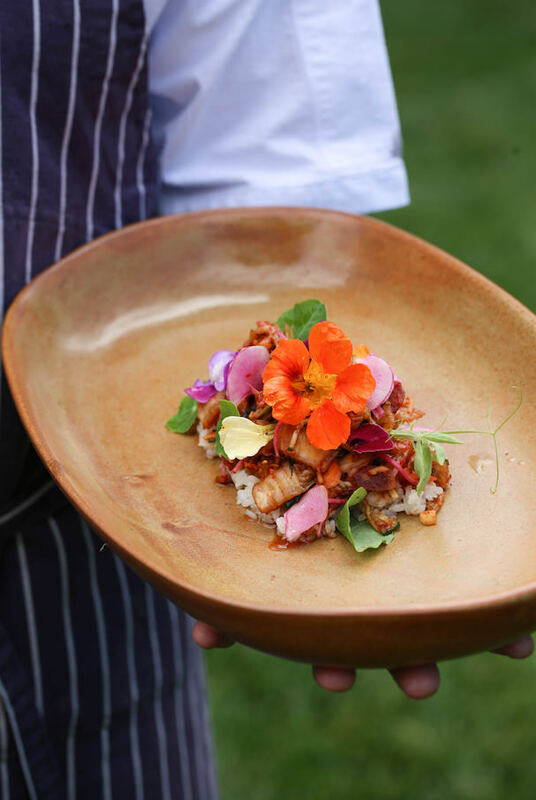 This recipe from Jordan Winery combines the exotic flavors of a traditional kimchi with crisp, garden-fresh greens and peppery Nasturtium leaves and blossoms. It’s a beautiful and vibrant dish that pairs perfectly with the bright acidic flavors in a Jordan Chardonnay. Pair with Jordan Chardonnay, 2013 Russian River. In a large bowl or tub combine cabbage, kale, salt and enough water to cover. Allow the greens to brine overnight. The next day squeeze as much of the brine out as possible and place the greens in a large non-reactive working bowl. To the bowl add all of the remaining ingredients but the reserved kale, cucumber and nasturtium. Toss all ingredients thoroughly to evenly distribute and then place in a sterilized pickling crock or tub. Gently weigh the mixture down and loosely cover. Allow the kimchi to begin to ferment at room temperature for 24 hours. After 24 hours, the crock may be moved to refrigeration. Toss the mixture every two days for a total of seven days. Add the reserved kale and Japanese cucumber and toss once more to combine. Refrigerate for a final day and the kimchi is ready to serve. Note: the texture and bite of the one-week-old kimchi is wonderful, but it will become even more complex as the fermentation progresses. Keep revisiting and readjusting seasoning as desired. Gently fold in the nasturtium blossoms and leaves at the time of service. Other fresh garniture may also be added at this point; fresh peas, favas and their greens are seasonal favorites. Discover more delicious food and wine pairings here.